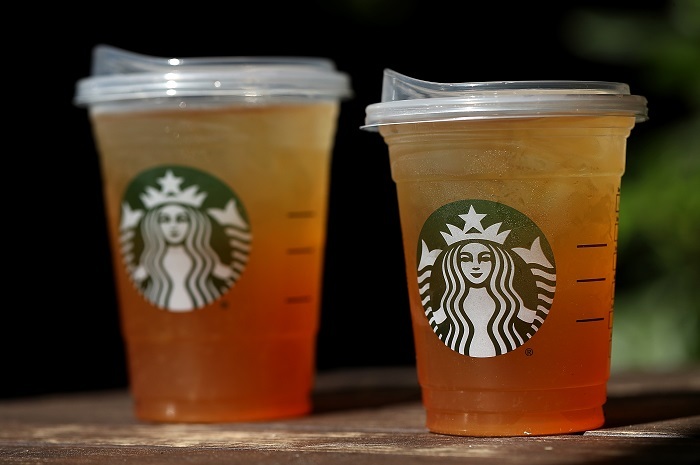 Starbucks announced on Monday that they will remove plastic straws from their stores by 2020. The company says that this move will result in the elimination of more than 1 billion plastic straws being used per year. This follows the recent news that Seattle, where Starbucks is based, is banning plastic straws from food service establishments. Iced beverages, for the most part, will be served with a new, strawless lid that's appearance has been compared to a sippy cup. The new lids for iced drinks will start being rolled out this fall, beginning with stores in Vancouver and Seattle. Frappuccinos will still be served with the traditional dome lid, however straws will be made from paper or compostable plastic. If you prefer drinking another iced beverage with a straw, you can also request the eco-friendly alternative straws. Colleen Chapman, vice president of Starbucks global social impact overseeing sustainability, says that "Not using a straw is the best thing we can do for the environment." Nevertheless, there are critics of the movement to ban plastic straws since they actually make up only a very minor portion of plastic pollution in oceans. Plastic straws only account for about 4 percent of plastic trash by number of pieces and add up to 2,000 tons of the 9 million tons of plastic that ends up in waters. Consider that the plastic straw is the smallest plastic component of a Starbucks cold beverage, which comes in a much more sizeable single-use plastic cup and lid, though Starbucks says their cups and lids are recyclable. Additionally, people with disabilities have concerns, given that soggy paper straws can increase the risk of choking in people who may already have swallowing difficulties. Paper and silicone straws also tend not to be flexible, which can make independent drinking difficult for someone with motor and neurological conditions, and reusable straws are not easy to clean, leading to sanitation issues. Hyatt also announced on Monday that they plan to phase out plastic straws. Beginning September first, plastic straws will only be available upon request at the hotel chain. Starbucks, thus far, is the largest food and beverage retailer to commit to banning plastic straws. The company's plastic straw ban will affect all 28,000 of its stores worldwide.